The Xtronix Battery Watch is designed to prevent deep discharge in Lead Acid Batteries by disconnecting the load when the battery voltage reaches a preset value. A Lead Acid battery can be permanently damaged if a load is left connected to it which causes the battery to discharge completely (deep discharge). To maximise battery life, the load should be disconnected from the battery when the battery voltage reaches the battery manufacturer’s recommended ‘cut off’ voltage. The actual ‘cut off’ voltage is affected by the battery construction and the battery loading – refer to the battery manufacturer’s specification to determine the optimum cut off voltage. The voltage at which the unit disconnects the load can be preset prior to connecting the unit to a battery and load. 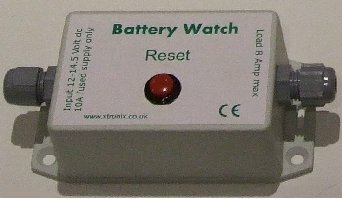 The Xtronix Battery Watch can also be supplied with an optional latching relay that can be set by an external alarm signal. Once set, the latching relay stays set even if the power is removed from the unit. This is intended to provide a permanent alarm state for telemetry systems. The latching alarm output is presented as a change over contact (NO-COM-NC). It is cleared when the reset button is pressed.